Ivor Gurney was an artist equally and unusually competent as both a poet and composer. A prolific composer of over 330 songs of varying quality, several are considered masterpieces of the genre. He also wrote orchestral, instrumental and choral music, much of which is only slowly emerging from years of obscurity. Because of his status as a War Poet, it is through his widely-anthologised and unusually direct poetry that he is probably best known today. However, he considered himself to be a composer first and only turned to verse through the difficulty of composing at the Front. Indeed, he is noteworthy as being one of a handful of composers to write music while in the trenches, which gives pieces such as "By a Bierside" a special extra-musical atmosphere. 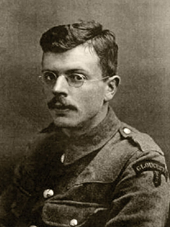 Gurney was not killed in World War 1, but was invalided out following a gas attack in 1917. In 1922 he was declared insane and committed to an asylum; he was to remain a patient at various institutions until his death aged 47. For many years was considered a casualty of the war, but the reality is more complicated - Gurney already had a history of mental illness, and it has even been argued that the war held his illness at bay. Gurney is not an easy figure to write about since the trajectory of his life, particularly post-WWI is undoubtedly one which has at its heart a victim of a troubling mental condition which even now is not fully understood.